Davines Minu Hair Serum Review: No More Frizz! Because I am someone who bleaches and dyes her hair every six weeks, religiously, I am constantly on the lookout for products that will bring my dry and frizzy hair back to life. Actually, I have been on what feels like a lifelong search for a product that genuinely banishes frizzy hair. My locks are naturally wavy and have always been on the dry side, and let’s just say I have never been that girl who can look incredible when air-dying her hair after a shower, although I have always wanted to be that girl. But until recently, I had never found a product that actually worked. Most of the sprays and oils and serums I tried were a total fail. A few got rid of some of the frizz, but never all of it, and some others weighed my hair down too much, making it look oily and bad. But then last summer, my hair prayers were answered by Davines Minu Hair Serum. I ordered it out of curiosity after seeing celebrities with great hair rave about it in a magazine, and anyway, I already had a few Davines products I loved (their Oi Shampoo is a bestseller for a reason). The Minu Hair Serum is actually not made with frizz prevention in mind, exactly. According to the description, it’s “for hydrating and protecting colored hair. 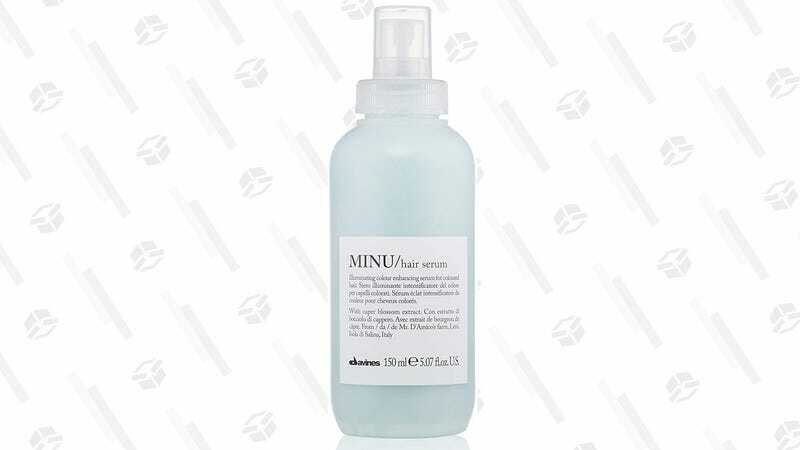 MINU Hair Serum is designed to extend the duration of color and enhance its shine.” But since frizz prevention and hydration pretty much go hand in hand, it still seemed legit. The first time I tried it, I was apprehensive, my earlier enthusiasm replaced with doubt. To really test it out, I washed my hair with Davines NouNou shampoo and conditioner (which I usually use), then decided to let my hair air dry. I only styled with the serum, to get a real idea of how it worked - generally I use a leave-in conditioner spray and a hydration cream as well. I let my hair do its thing, and when I dared to look in the mirror an hour or so later, I was shocked: my hair wasn’t frizzy. It was a miracle. Normally, when it air dries, it gets super frizzed out all along the edges, leaving my looking like I rubbed my head all over a sweater. This time, it didn’t look like that. It was truly frizz-free, it had a bit of a shine to it, and it felt soft too. 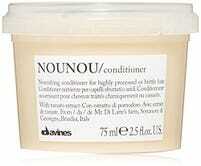 Davines Nounou Shampoo, 2.5 fl. oz. The next time I washed my hair, I tried the serum with my other products, and got the same result. I tried it another time without other products as well, and got the same result as the first time. In other words, it was pretty clear: the serum was doing wonders for my hair. I’ve been using this serum for a little over six months now, and I can say that it is definitely less frizzy overall. I haven’t really tried any other new products since then, so I’m pretty confident it’s the Davines. Some things I love about it: it doesn’t really have a scent (I hate an overpowering smell in my hair), it helps boost my blonde color, and it lasted me the entire six months before I had to get a new one - I also like that it’s a very pretty blue color, not that that matters. Things I don’t love? I would say the price, which, at around $26, isn’t the end of the world, but isn’t exactly drugstore cheap either. Overall, it’s something I would recommend to anyone looking for less frizz in their life, especially if they have over-processed and dyed hair like myself. This one is worth it.